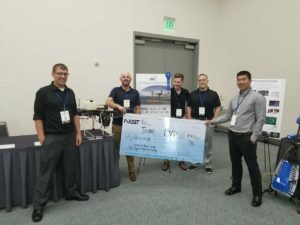 DV8 Tech has been named the first-place finalist in the National Institute of Standards and Technology (NIST) UAS Flight and Payload competition. Placing above nine other finalists from across the country and the world, DV8 Tech demonstrated expert UAS knowledge in design, construction, and flight of unmanned aircraft systems (UAS). This design concept will transform the way first responders think about and use UAS technology. Hosted by NIST Public Safety Communications Research Program, the competition sought unique and innovative design concepts that displayed increased flight time and versality in supporting communication operations for search and rescue and public safety missions. DV8 Tech developed and then executed a hybrid gas/electric drone that was successful in demonstrating positioning and accuracy with the ability to carry 10, 15, and 20-pound payloads. “In our opinion, the main drawback of drones was battery life, the most an organization could expect was about 30-40 minutes. We decided to revolutionize the current state of the drone industry and developed a state of the art hybrid system that can keep a drone carrying up to 20 pounds of equipment in the air for upwards of two hours. This new technology is exactly what first responders need to save lives,” said Toby Tracy, competition team member and DV8 Tech UAS technician. DV8 Tech was officially named the competition winner at the 2018 Public Safety Broadband Stakeholder Meeting in San Diego, CA. DV8 Tech showcased their drone, presented to over 500 attendees at the conference about their concept, and met individually with interested first responders and public safety officials. country’s first responders. The first responder community will greatly benefit from drone technology and we are excited to be leading the way,” said Ryan Zoller, DV8 Tech president and founder. DV8 Tech was founded in 2017 in Salina, Kansas by a group of industry professionals and UAS students from Kansas State University Polytechnic Campus with a mutual passion for drones. DV8 Tech provides custom tailored technology and drone solutions for commercial purposes. For more information on DV8 Tech and to discuss collaboration opportunities, please contact 785-404-6017 or info@dv8-tech.com.